This page is dedicated to Brian “Cozmik” Scott. 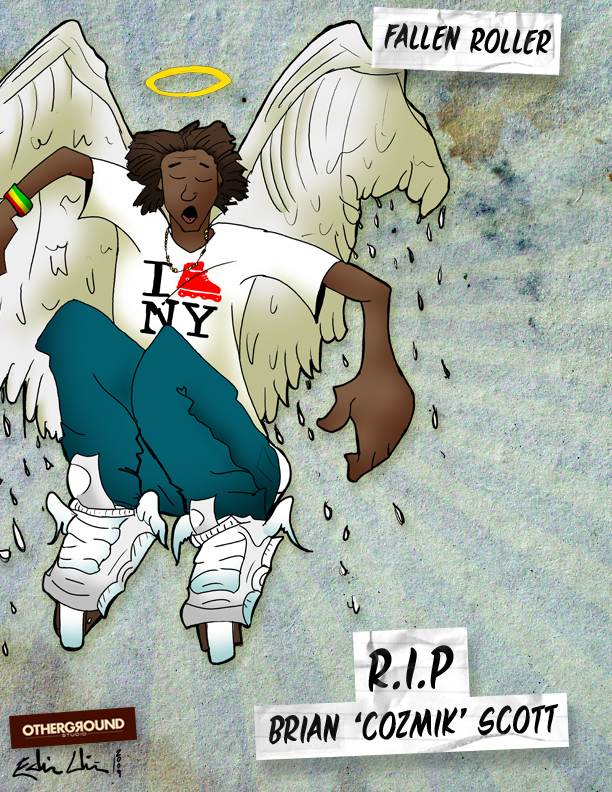 A Brooklyn, NY skater and friend who was killed before his time. Brian was a good kid who was gaining exposure in our scene in a very rapid pace. Below are a few links to articles about Brian’s tragic passing and articles that show how truly gifted and friendly Brian was. Though we are destined to move on, I hope this page allows everyone to remember Brian at his best. He will always be missed but never forgotten and this dedicated page will make sure of that. If you have anything you’d like to add that will help remember Cozmik, leave it as a comment. Thank you. No words could describe the shock that this has given all of us. I can only offer one comment and that is that I’m so happy that everyone around new york city is recognizing Brian for who he was and what he stood for. He doesn’t just go down the line of the many poor souls that got taken away due to violence, but he gets lifted up to recognition for who he truly was. RIP Brian. Skate In Peace Cozmik, You will be missed and never forgotten . . .
dont worry son we will me meet you up their one of these days just keep rolling son try to find your self some ledges over their R.I.P. I didn’t really know him personally but i knew of him and of his up and coming success. Its really sad that unfortunate things like this happen (especially to those who don’t deserve it). I skated with him a few times and the biggest thing that stood out to me was his smile. It was like he had a glow around him that made everyone just want to have fun and enjoy themselves. He had a lot of heart when it came to his skating. He will most definitely be missed by every roller that knew him and I’m positive that his passing on will and have touched many hearts that have heard about this recent tragedy. But you can best believe that he will NEVER be forgotten. Life is really short and unexpected twists and turns happen all the time to everyone and anyone, so live life to the absolute fullest because you never know when its your time. I give my condolences to his family, friends, and loved ones. R.I.P Brian “COZMIK” Scott. Hopefully when we see you again, you can show us all the good skate spots up in heaven……..